Robot Dinosaur toys. Need I say more? Every kid loves Dinosaurs. Every kid loves Robots. Put them together and you have Toys that are sure to set their imaginations ablaze. Before you go buy some crummy Chinese robot dinosaur that will fall apart in 2 days, take a look at my top picks that will make any child jump for joy. Let’s take a look at each of them in turn to see why I like them and and make sure to watch the videos to get a really terrific idea of the best ones for your child. Fisher Price Imaginext Dinosaurs – Great for Kids 3-8! Ok, let’s face it — kids love dinosaurs but they also love toys that shoot things and do all sorts of crazy stuff that “realistic” dinosaurs could never do. That’s where Fisher Price Imaginext dinosaurs come into play. Frankly, kids get all excited with the idea of “pet” robots like the Zoomer Dino, but it’s hit or miss whether children will actually play with them after they’ve seen what they are all about. 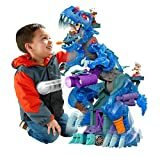 The versatility of the Imaginext line of toys — the figurines and little extra pieces — set these robot dinosaurs apart, because they can be played with over and over. They fit better into imaginary play-worlds created by children. I expect kids will get many more hours of play out of these dinosaurs than any of the other “more sophisticated” dinosaurs on the market because of this ability to integrate with their other toys. To top it off, the quality of these toys is insane. They have that legendary Fisher Price durability that you just don’t find that often anymore. Imaginex toys includes all your favorites, but we’re looking at robot dinosaurs especially, so let’s examine at my top 3 including the Imaginext Jurassic World Walking Indoraptor, the Imaginext Motorized T-Rex, but first, the Amazing and HUGE Imaginex Ultra T-Rex. This Robo-Rex is Huge! 2 ½ Feet of Awesome! The Imaginex Ultra T-Rex and the Ultra T-Rex Ice (if the T-Rex lived in the frozen north) are the top-of-the-line Robot dinosaurs from Fisher Price. Are they realistic? Not at all. In fact, they are really T-Rex skeletons all gussied-up with lots of cool features to really get your kids to use their imaginations (that’s what Imaginext is really all about). Turn the power-pad on its tail and it starts walking. The power-pad at its left hip makes it stand at its full height and turns on LED lights in his eyes and spikes. The 3rd power-pad chomps his mouth with great sound effects and fires his arrows. Buttons fire boulders (or Ice boulders for the T-Rex Ice) at the enemy and if that’s not enough, you can even shoot one of his massive claws! These massive toys are on every kids wish list – but don’t forget you’ll need to buy 4 AA batteries which are not included. Amazon Price: $253.99 (as of April 26, 2019 4:44 am - Details) Product prices and availability are accurate as of the date/time indicated and are subject to change. Any price and availability information displayed on the Amazon site at the time of purchase will apply to the purchase of this product. With realistic sound effects while he’s walking, standing and firing projectiles, this scary dino makes no bones about it. He’s ready to conquer prehistoric lands – and the imaginations of young adventurers everywhere! Imaginext…Turn on Adventure! Amazon Price: $100.00 (as of April 26, 2019 4:44 am - Details) Product prices and availability are accurate as of the date/time indicated and are subject to change. Any price and availability information displayed on the Amazon site at the time of purchase will apply to the purchase of this product. Your little dino lover’s imagination gets a gigantic boost from the Imaginext Ultra Ice Dino. He’s ready to conquer icy prehistoric lands – and the imaginations of young adventurers everywhere! Imaginext…Turn on Adventure! This one will get your kid’s imagination running and is a great choice if you don’t want to stump the $100 for the giant T-Rex. At the push of a button the Motorized T-Rex walks forward with stomping sound effects. Then it roars! Then the armour transforms and it is ready to fire the included projectile cannon. Fire the cannon and hear the cool cannon sound effects. This one even has batteries included. Take a look at this video to see all of the features. Amazon Price: $29.99 (as of April 26, 2019 4:44 am - Details) Product prices and availability are accurate as of the date/time indicated and are subject to change. Any price and availability information displayed on the Amazon site at the time of purchase will apply to the purchase of this product. Press a button and this T-Rex comes to “life”. First he walks, then he roars, then his armor transforms and the cannon is ready to fire. Best of all, this walking, roaring, armor-transforming T-Rex makes different sounds with every action. You hear the crash of his giant footsteps, his loud, booming roar, and the thunderous blast as the cannon fires. 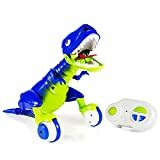 This Motorized T-Rex is sure to keep your child entertained for hours of fun dino play. The latest robot dinosaurs from Fisher-Price are in the Imaginex Jurassic World series. These toys are going to be released over 2018 and the first available is the Indoraptor – one of the most ferocious dinosaurs from the movie. The really cool thing about this toy is that it uses motion sensors to chase after the ATV – just like in the movie! Can Owen get away? That’s for your child to find out! The faster he goes, the faster the robo-raptor chases. No doubt this will be one of the hottest robot dinosaur toys of 2018. Check out the video to see a demonstration. Amazon Price: $59.99 $30.69 You save: $29.30 (49%) (as of April 26, 2019 4:44 am - Details) Product prices and availability are accurate as of the date/time indicated and are subject to change. Any price and availability information displayed on the Amazon site at the time of purchase will apply to the purchase of this product. What’s that booming sound? It’s the ferocious Walking Indoraptor—it’s on the loose! With the turn of the Power Pad, kids can send the angry dinosaur stomping forward on its own. Place Owen in the ATV and send him racing into action! Roll the ATV in front of the dinosaur to provoke it into chase mode—the faster the vehicle rolls, the faster the Walking Indoraptor will chase! Can Owen get this dangerous dinosaur under control? That’s for your young adventurer to decide! Imaginext Imagine What’s Next! 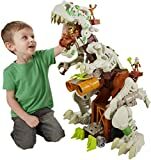 There are more really cool Imaginext Robot Dinosaurs including the Jurassic World: Fallen Kingdom Imaginext Jurassic Rex Figure (shown below) coming out in time for Christmas 2018 and I’ll take a look at those when they become available! Now, what do you do if you want more than just a toy robot? The Robotime 3D dinosaurs in the “Sound Control” series are neat wooden 3D jigsaw puzzle kits that you have to assemble. When you’ve done that, these battery-powered dinosaur toys walk and roar – controlled by your clapping hands. T-Rex, Triceratops, Apatosaurus, and Stegosaurus. You can also check out their Mammoth. The link I’ve got to the Amazon page below conveniently has all the different models on it. You just have to click on the one you want. The wonderful thing about these toys is the arts and crafts aspect to them. They look really cool, and your child’s friends will gravitate toward them if they are displayed on a shelf. It will be a real accomplishment for your little model builder to assemble these and they’ll get a sense of pride and satisfaction when it actually works. Now a bit about the assembly process – these things can be a real challenge. I’ve heard that you can expect to spend around an hour or two to put them together. For kids under 12, you’ll definitely need to help them build it so they don’t get too frustrated. Even some adults have found them tricky. Read and follow the step by step directions carefully. Some purchasers recommend you pick up some wood glue to help the pieces stay together and make it a bit sturdier. Build it together for some great “together” time. Once the dinosaur toy is put together, and you’ve added batteries, it responds to clapping. Clap once for it to walk forward. Clap twice to turn left. Clap three times for it to turn to the right. It roars at the same time. Pretty awesome. Check out the links below if your child is the type that enjoys model building kits. Amazon Price: $36.99 $25.99 You save: $11.00 (30%) (as of April 26, 2019 4:44 am - Details) Product prices and availability are accurate as of the date/time indicated and are subject to change. Any price and availability information displayed on the Amazon site at the time of purchase will apply to the purchase of this product. 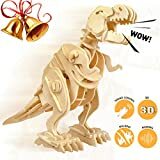 The Robotime 3D dinosaurs in the “Sound Control” series are neat wooden 3D jigsaw puzzle kits that you have to assemble. When you’ve done that, these battery-powered dinosaur toys walk and roar – controlled by your clapping hands. Follow the link and then choose the dino you want. This interactive robotic dinosaur is amazing! It is probably the most realistic, high-tech robotic toy ever made. It’s movements are lifelike. So much so that a boy or girl will probably have moments where they think it is alive – and that’s what you want. 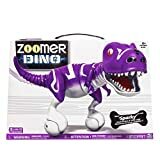 The Zoomer Dino toys really are just like a pet and perfect for any child over 5 years old (and much older – these things are cool!) You can’t go wrong. Now, these a really advanced robot dinosaurs but you should keep in mind that younger kids will probably get more playtime out of the Imaginext Dinosaurs shown above because they integrate better with their imaginary worlds. But if a robot pet it was the doctor ordered, this is the one. It has an amazing sense of balance and rolls around on two wheel “feet.” Very cool indeed! How does it do that??? Its eyes change color to indicate its mood. Seriously! If your little one pulls its tail, watch out! The eyes of the toy dino go red and it throws a fit. Yes, it gets angry. But give it a few tender rubs and its eyes will be green to let you know its satisfied. This is a very sophisticated robot that has lifelike movement of the head and tail. Very impressive design. The sounds these dino toys make are really cute. They remind us of those cute little raptors in the Jurassic Park movies. You know, before they got nasty. When they were cute. Check out the videos to see what we’re talking about! Amazon Price: $99.99 (as of April 26, 2019 4:44 am - Details) Product prices and availability are accurate as of the date/time indicated and are subject to change. Any price and availability information displayed on the Amazon site at the time of purchase will apply to the purchase of this product. 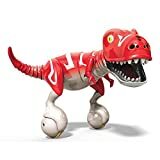 Check out the Zoomer-Dino Boomer at Amazon.com. We like Amazon for the free shipping, easy returns and competitive pricing. Make sure you select "free standard shipping" when you check out. Amazon Price: N/A (as of April 26, 2019 4:44 am - Details) Product prices and availability are accurate as of the date/time indicated and are subject to change. Any price and availability information displayed on the Amazon site at the time of purchase will apply to the purchase of this product. Discover the evolution of fun! Jester is the all-new interactive species of Zoomer Dino (Jokeasaurus) who can’t wait to make you laugh! His nose is full of sensors that detect your movement and help him sniff out fun. But watch out! Just like a real Dino he can get angry, spin around, chomp and roar! Using True Balance Technology, Jester perfectly balances on two wheels as he roams freely, exploring your home. 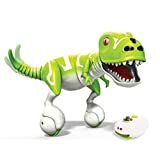 Use your hands to tame his Dino nature or use the remote control to record and playback his moves. You can even show them off to friends and family to reveal your dino mastery! Jester’s a little silly, so if you hear him giggling, it’s probably because he finds everything funny, including when you make him dizzy! Guide him by hand, hypnotize him, watch him perform tricks and more! Jester’s the evolution of fun! Bring home the laughs with Jester the Jokesaurus! He’s the life of the party! Amazon Price: $119.99 (as of April 26, 2019 4:44 am - Details) Product prices and availability are accurate as of the date/time indicated and are subject to change. Any price and availability information displayed on the Amazon site at the time of purchase will apply to the purchase of this product. Unleash the stealthy, aggressive and unpredictable nature of Indominus Rex in your home. 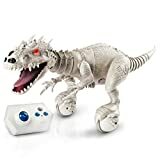 Featuring real sounds from the Jurassic World film and color changing eyes that communicate mood, the Indominus rex Collectible Robotic Edition is the most hauntingly realistic Zoomer Dino around. Amazon Price: $149.87 (as of April 26, 2019 4:44 am - Details) Product prices and availability are accurate as of the date/time indicated and are subject to change. Any price and availability information displayed on the Amazon site at the time of purchase will apply to the purchase of this product. Control him if you can! With real dinosaur movements, sounds and incredible dino-sense abilities, Sparky can detect when you're nearby and interacting with him. But watch out! Just like a real dino, he can get angry, spin around, chomp and roar. Tame his dino nature and build your friendship with attention, play and more! Amazon Price: $179.95 (as of April 26, 2019 4:44 am - Details) Product prices and availability are accurate as of the date/time indicated and are subject to change. Any price and availability information displayed on the Amazon site at the time of purchase will apply to the purchase of this product.